In these moving and revealing personal stories, eighteen Obama staffers bring us deep inside the presidency, offering intimate accounts of how they made it to the White House, what they witnessed, and what they accomplished there. We hear from a married gay staffer pushing the president towards marriage equality; a senior aide working to implement the Affordable Care Act while battling Stage IV cancer; a hijab-wearing Muslim adviser accompanying the President to a mosque. In each one we see the human face of government, staffers devoting themselves to the issues that have defined their lives. From the triumphs of Obamacare and marriage equality to the tragedy of the Charleston shooting, this book tells the history of the Obama presidency through the men and women who worked tirelessly to support his vision for America. More than just a history though, West Wingers is an inspiring call to arms for public service, a testament to the possibility of real social change, and a powerful demonstration of what true diversity, inclusivity, and progress can look like in America. Gautam Raghavan served as Barack Obama's liaison to the LGBT community as well as the Asian American and Pacific Islander community from 2011-2014. Prior to this, he worked for the Department of Defense, the 2008 Obama Campaign, and the Democratic National Committee. Raghavan was born in India, raised in Seattle, and graduated from Stanford. He currently lives in Washington, D.C. with his husband Andy and their new daughter, Maya. 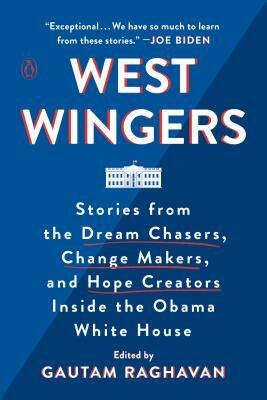 Contributors to West Wingers: Gautam Raghavan, Michael Strautmanis, Leah Katz-Hernandez, Brad Jenkins, Heather Foster, Cecilia Muñoz, Hope Hall, Michael J. Robertson, Raina Thiele, Lynn Rosenthal, Bill Yosses, Darienne Page, Deesha Dyer, Ned Price, Julie Chavez Rodriguez, Rumana Ahmed, Stephanie Valencia, and Aneesh Raman.